Despite having endured frequent jabs from Jon Stewart (or his writers), Arby’s is having a hard time letting go of the Daily Show host. First, the fast-food giant thanked him for being a friend in a montage of all of the unflattering Arby’s references made during Stewart’s tenure. Now Arby’s is bidding Stewart a food farewell with his very own sandwich. The sandwich, which has been dubbed The Daily Deli, is more a namesake of the show than of Stewart himself. As a tearful Ving Rhames notes, it will consist of double corned beef and deli mustard on marbled rye. 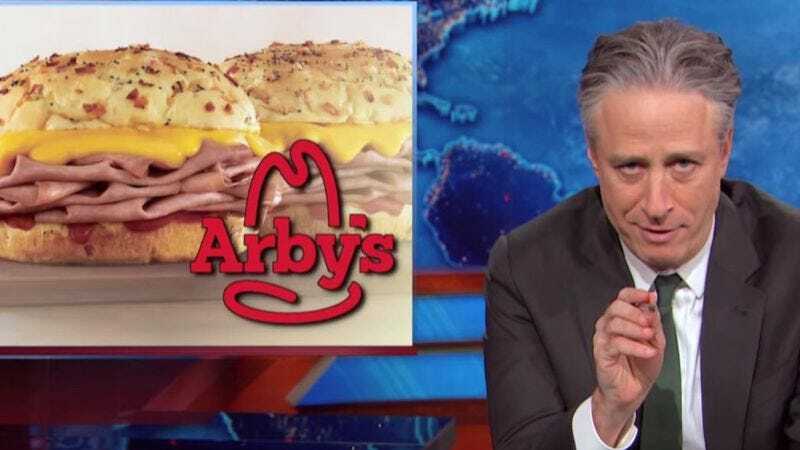 There’s no word on whether Arby’s staked out Stewart at lunchtime to find out what he likes to eat, or if the chain simply put together some of its least objectionable ingredients in an effort to get him to at least try the sandwich. The Daily Deli will be part of Arby’s secret menu, perhaps so that no one ever really has to admit to ordering the sandwich.